Deposits of nearly pure silica discovered by the Mars Exploration Rover Spirit in Gusev Crater formed when volcanic steam or hot water (or maybe both) percolated through the ground. Such deposits are found around hydrothermal vents like those in Yellowstone National Park. That's the conclusion of planetary scientists working with data collected by the rover's Miniature Thermal Emission Spectrometer (Mini-TES), developed at Arizona State University. The silica discovery, announced briefly by NASA in 2007, is fully described in a multi-author paper that appears in the May 23, 2008 issue of the scientific journal Science. The lead author is Steven Squyres of Cornell University, principal investigator for the rover science payload. The silica finding turns a spotlight on an important site that may contain preserved traces of ancient Martian life. 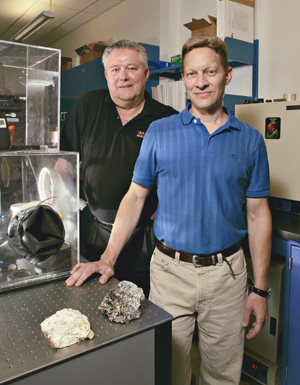 "On Earth, hydrothermal deposits teem with life and the associated silica deposits typically contain fossil remains of microbes," says Jack Farmer, professor of astrobiology in ASU's School of Earth and Space Exploration, part of the College of Liberal Arts and Sciences. Farmer is one of the paper's co-authors. "But we don't know if that's the case here," Farmer notes, "because the rovers don't carry instruments that can detect microscopic life." He adds, "What we can say is that this was once a habitable environment where liquid water and the energy needed for life were present." 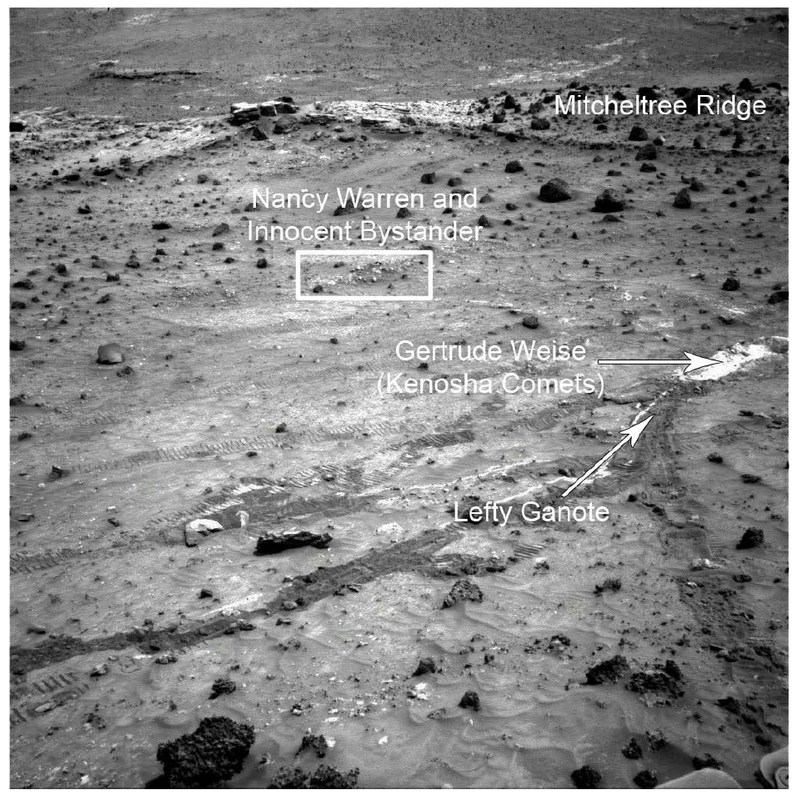 NASA landed the two Mars rovers, Spirit and Opportunity, on opposite sides of the planet in January 2004 to look for rocks showing the presence of water. As of now, the rovers are more than four Earth years into a mission designed to last just three months. Despite dust collecting on their solar panels and mechanical wear-and-tear, both are continuing to explore. The silica discovery unfolded in slow motion as Spirit emerged from hibernation after its second Martian winter. The rover spent those months on the edge of a football-field-size feature dubbed Home Plate. Home Plate lies in the Columbia Hills, a range of low hills in the middle of Gusev Crater, which spans 100 miles (170 kilometers) wide. The Hills rise about 300 feet (100 meters) above the flat lava plain that fills Gusev, but their structure and origin remain unclear to scientists. 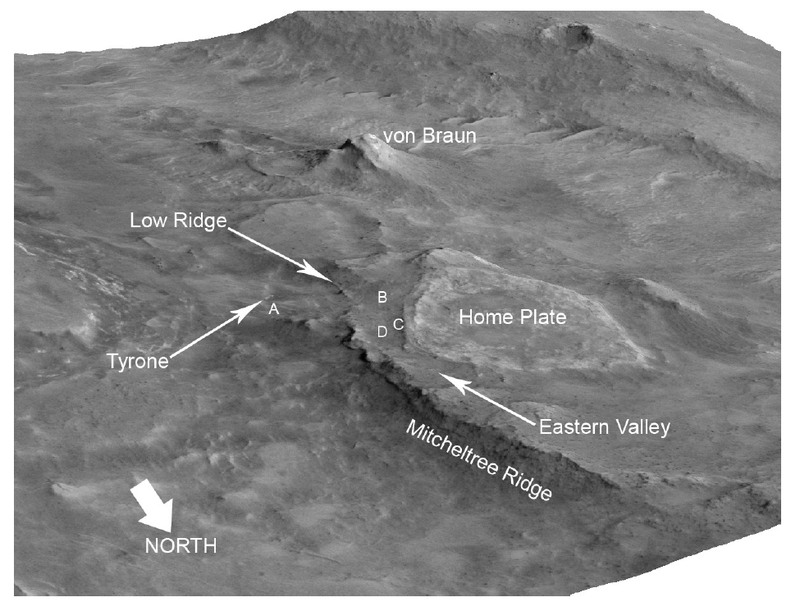 "We were going back to an area of exposed soil called the Tyrone site, which we didn't have time to investigate before winter began," notes Steven Ruff, a faculty research associate at ASU's Mars Space Flight Facility. Ruff is another of the paper's co-authors. The Tyrone soil proved rich in sulfate minerals, a phenomenon seen by Spirit at other locations in the Columbia Hills, where Spirit has been exploring since late 2004. While sulfates can form in several ways, water is involved in most. "While parked next to Tyrone, we used the Mini-TES to look at some nearby light-toned and knobby outcrops," says Ruff. Ruff is the geologist in charge of day-to-day operations for Mini-TES, which was designed by ASU's Philip Christensen, a Regents' Professor of Geological Sciences and director of the Mars Space Flight Facility. Each rover is outfitted with a Mini-TES. Ruff continues, "It wasn't clear what we were seeing in the knobby outcrops because they were contaminated with dust and wind-blown soil. But I thought they might be silica-rich." Additional surveys with Mini-TES identified other outcrops, similarly contaminated but likewise hinting at silica. 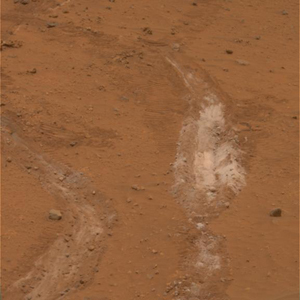 As it happened, the rover's jammed right front wheel inadvertently produced the "Aha!" moment. Ruff and others on the science team noticed that the stuck wheel had gouged a trench a few inches deep through the soil as the rover drove ahead in reverse, dragging the crippled wheel behind. "The trench looked bright white," Ruff recalls, "but we thought initially it was just more sulfate minerals." While parked nearby, however, Ruff got curious. "We aimed Mini-TES at the trench and it showed a clear silica spectrum. This prompted us to drive back to it, where the rover's Alpha Particle X-Ray Spectrometer told us the white soil was more than 90 percent silica. That's a record high for silica on Mars." Making such pure silica requires a lot of water, says Ruff. "On Earth, the only way to have this kind of silica enrichment is by hot water reacting with rocks." This, Ruff says, links the silica with Home Plate, which the rover team already knew was a volcanic feature. "Home Plate came from an explosive volcanic event with water or ice being involved," he explains. "We saw where rocks were thrown into the air and landed to make small indentations in the soft, wet ash sediment around the vent." Once alerted what to look for, the scientists found more silica in many places nearby. As Ruff explains, "It's not just the soil in a trench in one place. It's a broader story of outcrops that extend 50 meters [about 150 feet] away from Home Plate. It's not a small scale, modest phenomenon." The combination of geothermal heat and water produces a hydrothermal system like that which powers the hot springs, geysers, mudpots, and fumaroles (steam vents) of Yellowstone National Park. Astrobiologist Farmer helped with the mineral identification by supplying a variety of high silica rock samples from his laboratory collection. They included rocks from hot spring and fumarole deposits in Yellowstone and New Zealand. These rocks provided reference spectra for Mini-TES. "The best fit we got was with siliceous sinter," he says, referring to deposits of "opal," a type of amorphous silica laid down by hot springs. Farmer explains that hydrothermal systems generally precipitate silica and other minerals as heated groundwater rises, cools, and gives off dissolved gases. "If there were organisms living there," he says, "our terrestrial experience shows that microbes can easily be entrapped and preserved in the deposits." 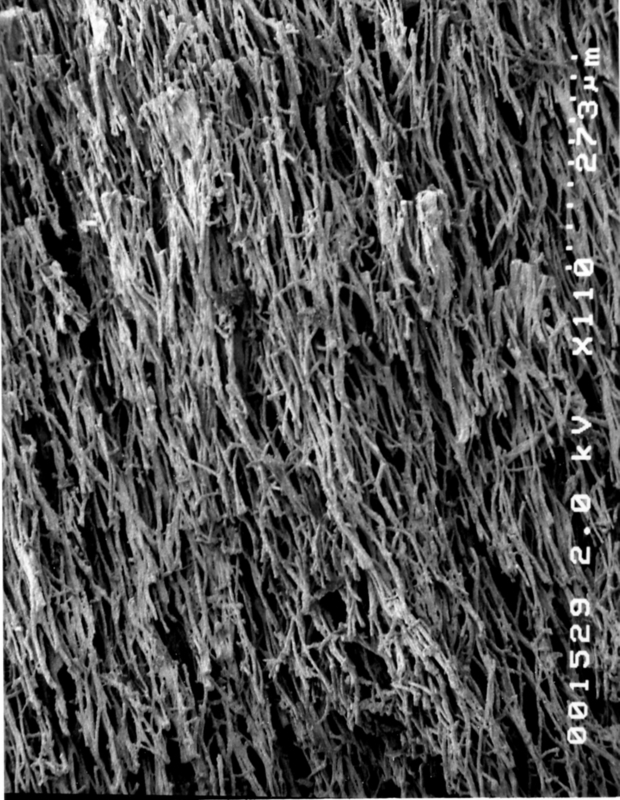 Silica, he notes, is an excellent medium for capturing and preserving traces of microbial life. Whether Mars ever had life is unknown. But if there was once a Martian biosphere, both Ruff and Farmer say the deposits around fumaroles and hot springs are ideal places to start hunting for it. Although the microscopic imagers on the current rovers cannot resolve the microbial remains seen in terrestrial hot spring deposits, Farmer notes that the new microscopic imagers now in development for future rovers should let scientists detect such features in situ. Says Farmer, "We just need to deliver such instruments to the right place. The discoveries at Home Plate have helped us know where to go next." Ruff adds, "This discovery has us really excited. This site is clearly the best example of a habitable environment that we've found in Gusev."